This blog post is one that I knew would be difficult to write, but I needed to write it regardless. And indeed this blog post is what inspired me to start blogging again after such a long absence from the blogosphere. So now, ladies and gentlemen, please give a warm welcome to Morgan, the new dog in the house. Morgan is actually my roommate’s dog, not mine. 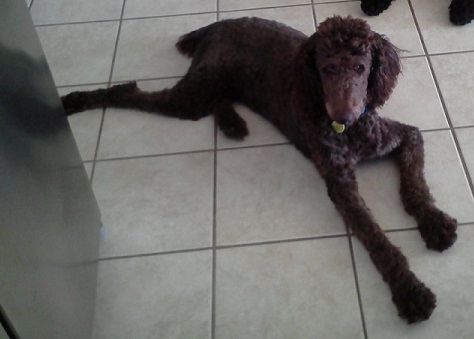 He’s a standard Poodle, chocolate brown in color, somewhere between 2.5 and 3.5 years old, and is very puppy-like in mentality. He came to us shy, immature, untrained, socially awkward, hesitant of people, and generally afraid of any human contact that occurred anywhere lower than the top of his head. His hair was cut short and he was smaller in stature than he should be. He was extremely thin, but thankfully his ribs did not protrude because, honestly, that would have been too much to bear. Morgan is a former puppy mill rescue. He was one of 27 dogs that were rescued from a puppy mill in either Oklahoma or Missouri by the National Mill Dog Rescue and send to the Arizona Animal Welfare League (AAWL) in Phoenix in early October to be adopted. While at the AAWL he received the name Morganstern. My roommate was watching TV that morning before heading to work and caught the heartbreaking news report. As he watched, a chocolate-colored standard Poodle was shown being carried into the AAWL facility by a volunteer. Later in the news story the dog appeared again, this time standing forlorn on the sidelines as the other rescued dogs ran around and tasted freedom for the first time. He looked lost, confused, in pain, and desperately in need of reassurance. I freely admit that I was initially opposed to the idea of a third dog in the house; two dogs can be a handful at the best of times and the articles that I read about the difficulties of normalizing a former puppy mill dog were disheartening at best. And yet, on this Thanksgiving Eve, I am so thankful that I opened my mind to the possibility. My roommate signed the adoption papers the night of October 23 and became Morganstern’s Morgan’s forever dad. Fast-forward five short weeks and Morgan is a changed dog. He looks to his new brother and sister for direction and guidance and they provide it in abundance, teaching him how to use the dog door, how to live in a house with humans, how to differentiate between sounds, and how to play. He still has much to learn but he has mastered so much already. As I write this he is sleeping in his brother’s dog bed, his sister asleep on the floor close by. He looks so comfortable curled up in the bed; I’d take a photograph but it would be unfair to disturb him. He is safe, he is loved, and he made it home for the holidays. I have blogged in the past about going back to school and pursuing a degree as an adult, so earlier this year I decided I needed to take my own advise. I have always been interested in aviation so finally settled on a Master of Aeronautical Science (MAS) degree offered by Embry-Riddle Aeronautical University (ERAU). My first class started at the end of May and I’m now finishing up week 2 of my third class. How the time has flown already but I have learned so much. Being back at school isn’t easy; I should know because I completed my bachelors degree as an adult and then started into my first master’s degree shortly thereafter. It’s not easy working full-time and managing 3 dogs at home (it used to be 2 dogs until recently) plus having the normal challenges and activities of an adult without having to find on average 10-15 hours of quiet time that can be dedicated to study. But it’s possible to make it happen; we all like to say “where there’s a will there’s a way” but putting it into practice is a little harder. It was easier to study when I lived alone in an apartment and didn’t have a dog in my life, but you manage, and you find ways to carve out the time you need for each week’s activities. For example, when there were just 2 dogs they were quite happy to crash out on the floor of my home office at night while I read my assigned chapters or worked on a paper or other writing assignment – in essence we were all going to school. But the new dog needs a little more supervision right now as he learns what’s a toy and what’s not, and what part of the house doubles as a canine bathroom in an emergency (hint: no part). But I’m done with my week 2 activities so clearly I was able to get everything done, so it’s possible. Substitute dogs for children and the challenges are a little different but it’s still a constant struggle of balancing school and life. But it can be done, and there are millions of us around the world doing it every day. So how about you? Do you have a long-abandoned degree that you’ve always wanted to finish but couldn’t? If you are still breathing then you have the means at hand to complete the program and finally graduate. So stop putting it off and start studying – it’s tough work and requires some life rearranging, but you’ll never regret doing it. I haven’t blogged in several months, and I’ve missed spending time composing my thoughts in neat paragraphs, but I’ve been busy with other activities that have soaked up my available time. And, like everything else, once you stop doing something on a regular basis it’s easy to forget about it and harder still to return to the activity. But I’ve had several potential blog posts pop into my head recently so I decided to put other things aside, dust off my WordPress username and password, and get back to doing what I enjoy. No promises that anything I write going forward will be interesting or offer anything of value to mankind, but you can’t make that judgment call until I commit my thoughts to print.